The EU will offer visa exemptions to U.K. travelers, even if Brexit takes place without a deal. But the law would require the U.K. to offer reciprocal visa-free travel to all EU nations. Here, customs signs are seen in London's Stansted airport. 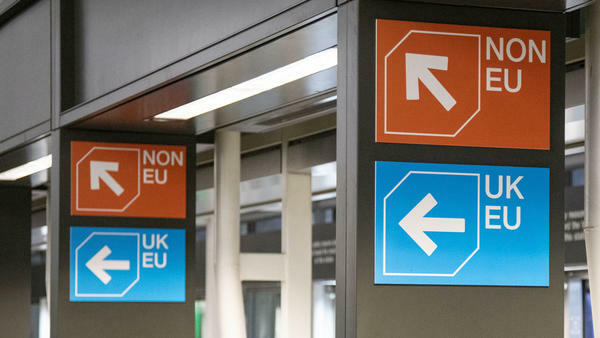 With the U.K. poised to leave the European Union, one basic question has loomed over the complicated debates over soft borders and no-deal exits: After Brexit, would Brits be forced to get a visa to visit the EU? On Thursday, the EU Parliament gave its answer: "No." The EU policy requires full reciprocation from the U.K. government — meaning that if citizens of one or more EU countries are required to get a visa to visit Britain, the EU will reinstate visa requirements for U.K. citizens. The plan was approved as EU representatives work to get policies in place for a wide range of possible outcomes from the British government's tortured attempts to extricate itself from the EU. "This is an important step for guaranteeing visa-free travel between EU and U.K. after Brexit, especially in case of no deal," said Bulgarian Parliament member Sergei Stanishev, who advocated for the rule. The EU's new law still needs the EU Council's official approval. But an EU press officer tells NPR that it "will be in place in time for the scenario of a no-deal Brexit on 12 April." "As regards pets, they will still be allowed to travel, but the conditions will change since new controls will have to be carried out at the EU's borders with the U.K.," said Jyrki Katainen, an EU Commission vice president whose purview includes health and food safety. With Brexit debates still sharply dividing lawmakers in the U.K. Parliament nearly three years after a public referendum, the EU plan does not set a specific date for taking effect. Instead, it's predicated on the U.K. leaving the union. "The legislation will apply from the day following the U.K.'s withdrawal from the European Union," the EU Parliament says. "From that date, U.K. nationals who are British citizens will not be required to get a visa for stays in the EU of up to 90 days in any 180-day period." In addition to the visa question, the EU said Thursday it's also preparing contingency plans for other essential logistical operations, from ensuring the supply of medicines to food safety and agricultural standards.